In her controversial new music video, Erykah Badu strips and falls to ground in Dealey Plaza. Dallas native Erykah Badu's new music video portrays her taking off her clothes and then dying near where President John F. Kennedy was assassinated. The "guerilla-style" video for the song "Window Seat" was shot in one take as she stripped while walking in Dealey Plaza on March 17. Badu released the music video Saturday. "I was petrified while shooting this video ... but liberation began to set in. I conquered many fears in that few moments," Badu posted on Twitter on Sunday. Families can be seen in the background. Badu said on Twitter that she prayed the children who were there wouldn't be "traumatized." Some are offended by the Erykah Badu video that depicts her stripping at the site of President Kennedy's assassination. The video begins with a 1963 radio broadcast describing Kennedy turning onto Elm Street. Badu is then shown in a parked car. Then she walks toward Elm Street while taking her clothes off. Badu said on Twitter that she could hear people yelling things at her but she kept going. People were yelling things such as "This is a public place," "You ought to be ashamed," and "Put your clothes on," she said. Badu, a mother of three, said on Twitter that she told her children about her plans to film the video. Her 5-year-old daughter just asked for another serving of pudding. Her 12-year-old son said he would tell anyone who teased him about the video that his "mom is great" and "she was having fun." "I immediately took myself less seriously," Badu posted. The city of Dallas said in a statement that Badu's production company did not get permits or contact the city. Commercial film, video and photo shoots must be approved by the city. Guerilla videos are usually shot in one take because the crews know they would face arrest or penalties if they are caught, the city said. Badu said she made sure to put money in the meter in case the police showed up. "After last action, we ran like hell! lol," she posted on Twitter. She said they didn't even take the time to look for the man who was picking up her clothes. Dallas police said they do not plan on filing charges against Badu, who lives in Dallas. But the department said it would consider filing indecent exposure charges if witnesses came forward. No one in Dealey Plaza at the time of the filming called police, Dallas police said Monday. 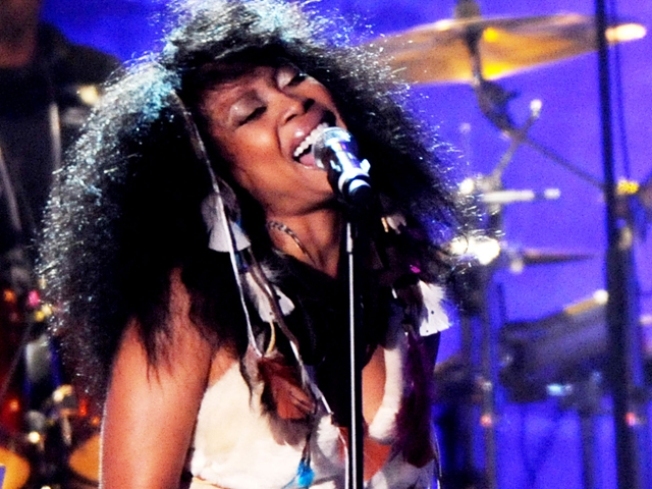 Badu's latest album, "New Amerykah Part Two: Return of the Ankh," will be released Tuesday.